Posted December 29, 2016 by Tyler J. Smith & filed under Announcements. 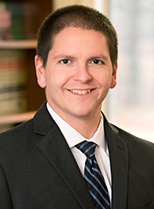 Tyler Smith, an associate attorney at Libby O’Brien Kingsley & Champion, LLC, was selected to participate in the 2017 Maine State Bar Association Leadership Academy. The Leadership Academy is an eight month program designed to foster professional growth and leadership skills among member attorneys who have been in practice for more than two years but less than 10 years. Attorney Smith will participate in training sessions throughout the program featuring professional facilitators and prominent speakers from various disciplines. Attendees will graduate from the program at the MSBA 2017 Annual Bar Conference at Sugarloaf. Congratulations Tyler!